Many years ago someone showed to me an article in a French fly fishing magazine referring to the chub as the "poor's man trout". 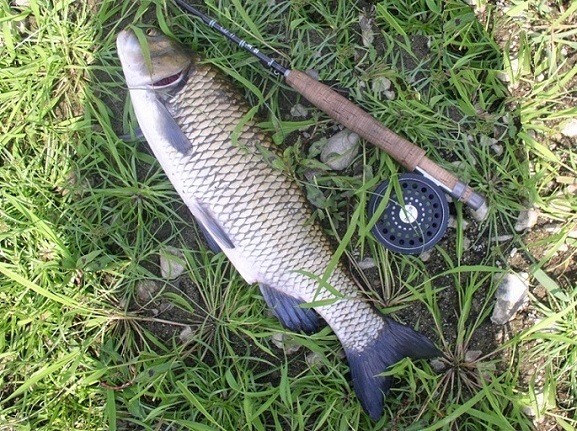 The European chub is distributed in many countries in Europe and is well present in my local waters - in rivers, artificial lakes and even in some higher elevation mountain lakes at 1500m altitude. Over here, the typical beginner in fly fishing is most likely to start fly fishing with the chub. The fish is abundant, free risng to a dry fly, so for anyone new in fly fishing its a good starting point to feel the magic and to sense directly the fight with a fish hooked on a fly while holding the fly line with his/her hands. Fighting the chub by holding the fly line is a feeling so different than when using a conventional spinning reel, that it may change the game for you forever. 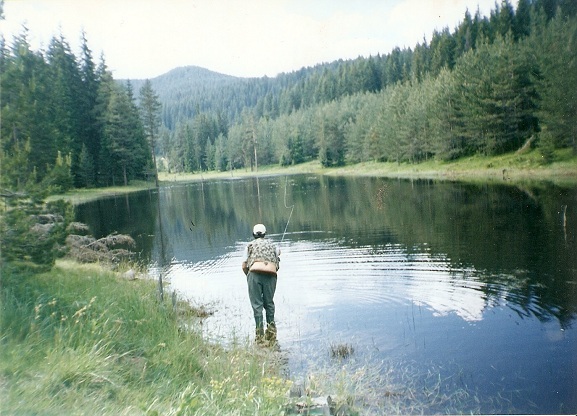 Or at least this is what happened to me when I first started fly fishing. It would be fair to say that I am a fly angler now, because I started fly fishing for chub. Since the end of 1992 till the late spring of 1998 I was fly fishing my local waters exclusively for chub, sometimes for 90+ days a season! The good thing about it, was that you can catch many, many chubs on a dry fly and when the fish is not feeding on top, you can try it with subsurface flies, in a way quite similar to as when you are after trout. I hooked thousands of chubs in dry fly manner with foam patterns, mainly beetles, but also using /foam/ wasps, ants and crickets. Those were my 100+ fish days and hooking a 100 chubs per day, fish from 30cm to 40cm+ and a few bigger ones, was do-able and could be done at the time in a one day session lasting anything between around 4-5 hours to 12 hours of /fly/ fishing. When the fish was shy on top, I was using nymphs and wet flies, but the best subsurface fly for lakes was an unweighted chironomus larva imitation. The takes with the larva were hard and mostly from bigger fish. Unlike when fishing the lake with the foam beetle dry fly cast within 1m to no more than 2m away from the steep banks under the pine trees, and at say 8-10m range, the midge larva pattern was cast further at distance in open, deeper water. 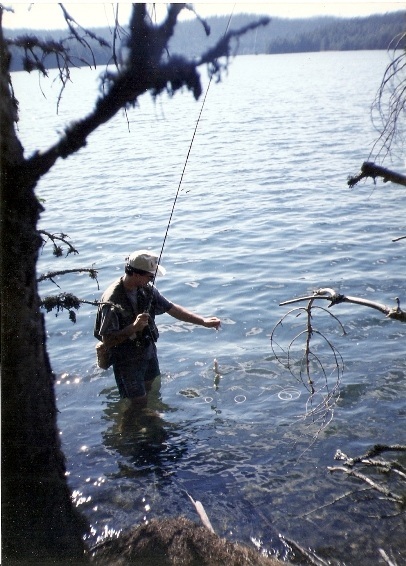 And then the best way how to fish it was - as I later read what Gary LaFontaine wrote about fly fishing alpine lakes for trout and describe as - "to do the hardest thing in fishing - just doing nothing"! After casting the fly I had to wait patiently for the unweighted larva to slowly sink, so I started counting seconds and typically a hard strike would follow when I was counting at around 60! It was quite different from the fast action on the top when fishing dries, but I must admit that my best chubs were taken on dries and it was a hard work to lure them on top, nothing like the easier to catch 30-35cm chubs! The chub is not a great fighter and could come out of the water like a wet sock - yes, I am quoting Paul /Arden/ here, but it feeds your fishing appetite by hooking huge numbers of chubs in such a way, that I soon realised that the only reasonable form of doing it right, was to start practising a catch and release, so now I was fishing for the sport and not for the pot anymore! I keep many good memories from that time period when fly fishing for chub or chub-ing if you like, and some stories are quite funny, but most importantly - the chub-ing days with a fly rod shaped the foundation of my fly fishing life. It also gave me a confidence in the method of fly fishing as a way to catch fish and gave me the sense of being somehow "special" - a fly angler was a rare bird in my home waters in those days! 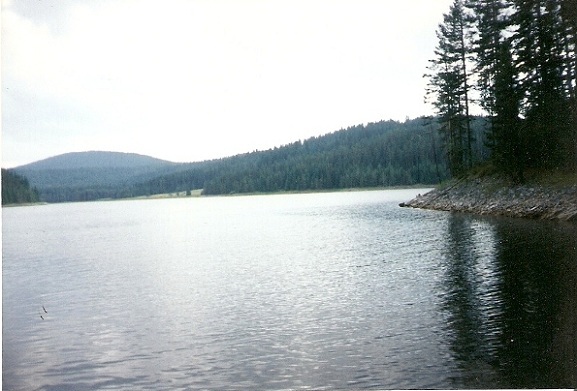 I recall a fishing day in a lake not far from Sofia, where 50 or so coarse fishermen throwing groundbaits, using conventional tackle, maggots etc. were occupying the banks, but none was catching any fish! A fly angler some 60m away from them, slowly wading the river inlet of the lake, was catching chub after chub, after chub, all good - 35cm to 40cm+ fish, hooking more than 50 fish, using just a foam beetle dry fly, and no other fisher hooked a single fish for the whole 3 hours of this session!I can still hear clearly the miserable sighs and unhappy moans of the bait brigade on the bank - "He is catching again", but it was time for a sweet revenge for the so many strange looks I got from the majority of the"regular" fishers I've met in my early fly fishing days!